Born in Greenock, Jimmie Spencer was “economic” about his date of birth and enlisted into the Royal Artillery in 1943. He saw action at Salerno, and then as an 18 year-old Bombardier and after his immediate officers became casualties, was a Forward Observation Officer, at Monte Cassino in 1944. On 8 May 1945 the now Sgt Spencer entered Austria as one of the 55,000 soldiers in Lt Gen McCreery’s British 8th Army; he was stationed in Lienz. McCreery determined that as many as possible should undertake winter warfare, climbing and skiing courses. Jimmie very quickly honed these skills on the Grossglockner, and in 1947 not only married Jane, but was transferred to the APTC as a SSgt instructor. In January 1948 he was the Chief Timekeeper at the inaugural Army Ski Championships held on the Kanzelhohe near Villach. This was to be the start of a long relationship with Army skiing and his ASA (as the AWSA then was) membership number was 007!! In 1951 his undoubted leadership and administrative skills became more and more evident and he was commissioned into the Royal Artillery. He continued to officiate and race at the Army Championships with 44 HAA Regt who were to be Nordic Champions five years running. Such was his all-round skiing prowess that he was a forerunner for some of the Nordic events at the 1952 Oslo Olympic Winter Games. Four years later at Cortina he made his Olympic debut, competing in the 30 km and 4 x 10 km Relay. At the time of his death he was 92, and the AWSA’s oldest living Olympian. He won several British Championships in the short-lived “Winter Pentathlon” and individual patrol, which was the forerunner of what is now biathlon, and represented the Army in the World Military Championships on several occasions. He won the Princess Marina Cup with 58 Med Regt, 40 Field Regiment and was CO of 2 Fd Regt when they also won. 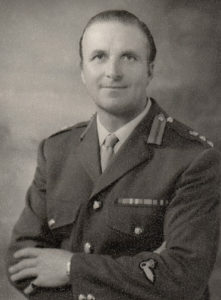 As a Company Commander at Sandhurst he galvanised the Academy’s interest in skiing and from 1966 to 1974 he was Chairman Army Alpine, which underwent a huge overhaul bringing the Championships and technical qualifications in line with international standards. He was also responsible for introducing some of the ASA’s earliest sponsors, notably the Bad Sachsa ski manufacturer Fritz Schäfer. In December 1973 he re-married, this time to Andy, and after 32 years’ service left the Army in April 1974. Shortly after they moved to Canada and remarkably he was to work for a further 32 years as President and CEO of the Canada West Ski Areas Association. To quote from their own Tribute: He was instrumental in guiding the development of the industry with wisdom and insight. Remarkable, Storied, Legendary, Monumental, Pillar, Leadership, Inspiration, Epic, Amazing Mentor are but a few adjectives that his peers have used to describe some of his many outstanding qualities. 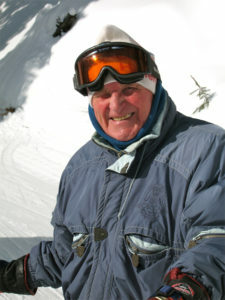 In 2011 he was inducted into the Canadian Ski Hall of Fame for his immeasurable dedication to the sport he loved. Jimmie was a soldier, with a genuine human touch, an athlete, top sports organiser, and above all a family man. He never lost his gentle Scottish lilt, or his appreciation of Scotland’s finest dram. He was awarded the Order of British Columbia in 2007 and it was in BC where he died – in Vernon, close to his beloved SilverStar Resort. Jimmie and Andy often travelled to Europe and in 1997 they attended the 50th Anniversary of the AWSA in St Moritz; here he met many old friends from the Gunners, AWSA and BOA. All of them, and many more, extend their deepest sympathies to Andy, sons Iain, David and daughters Lyndy, Kimmie and Emma and to many grand and great-grandchildren. At his request there will be no funeral. A gathering in honour of Jimmie will be held in the Spring of 2019, at SilverStar Mountain, where no doubt a dram or two will be raised. Details to be confirmed. In lieu of flowers donations may be made in Jimmie’s name to the Vernon Jubilee Hospital Foundation, www.vjhfoundation.org/ways-to-give/donate/ or the Canada West Ski Areas Association – Small Areas Fund https://cwsaa.org/policy/small-areas-assistance. Arrangements have been entrusted to PLEASANT VALLEY DIGNITY FUNERAL HOME, 4303 PV Road, Vernon BC V1T 4M4. Phone 250.542.4333.